West Brom exposed the frailties of zonal marking against Arsenal recently and Baggies boss Tony Pulis thinks his team might be able to do the same when Liverpool visit The Hawthorns. 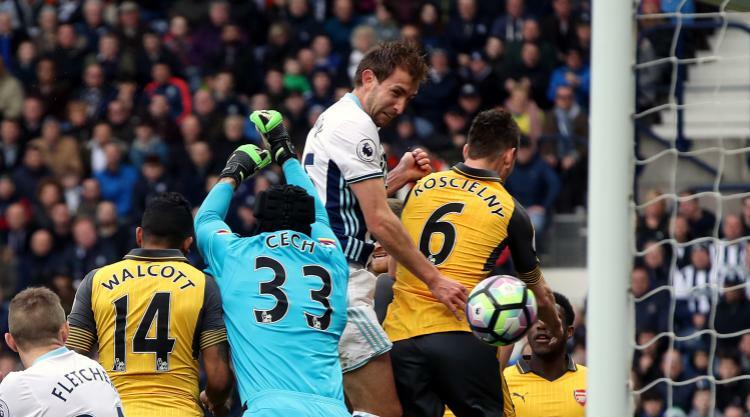 Arsene Wenger is an exponent of the often criticised system and it played into the hands of West Brom last month when defender Craig Dawson headed two goals from corners in a 3-1 home win against the Gunners. Like the Arsenal boss, Liverpool manager Jurgen Klopp also likes his side to defend areas rather than man-mark players. Pulis, whose team have scored 18 times from set-pieces this season - more than any other Premier League side, thinks it could be a way to get at Liverpool on Sunday but also accepts that the Reds pose a threat from balls into the penalty area too. "It's something we can take advantage of, very much so," said Pulis. "But we've watched tapes back again in the last couple of days and they're very good on set-plays themselves and if they go with the three centre-halves, they're a big team and they can be really dangerous. They get good quality in. "I think both boxes will have to be defended well off set-plays, but we work on certain things and we understand what we're trying to do as a group. "The biggest thing is to make sure everyone understands where they should be in their starting positions." Since those goals against Arsenal, West Brom have failed to score in the three Premier League games which have followed. Should they draw another blank against Liverpool, Pulis' players will earn themselves an unwanted record of becoming the first Albion team since Gary Megson's relegated 2002-03 squad to go four top-flight matches without finding the net. Pulis said his team have been working on their attacking play and finishing this week. "We've been doing shooting and finishing," he said. "We've highlighted the fact we've got into some wonderful positions and we've not hit the target. "That's been the biggest disappointment. We've been hitting people in the stands more regularly than we've been hitting the goal. "We've certainly got to make sure that when we get in there, we concentrate more on finishing and hitting that target. Even if the keeper saves it, someone else can tap it in. "We've been really wayward in the last two games. Like I say, we've had something like 37 or 38 shots on goal in the last two Premier League games but we've only had four or five shots on target. That ratio is not what we want. "I think it's concentration more than anything else, there have been lapses as much as anything else." Liverpool manager Klopp admits it would be wrong to rely on the Brazilian duo of Philippe Coutinho and Roberto Firmino to carry them until the end of the season. The pair sparked a turnaround at Stoke last weekend when they both came off the bench at half-time to score a goal apiece as the Reds came from behind to win 2-1. Firmino had been rested after enduring a punishing schedule in recent weeks, while his compatriot was recovering from illness, but both will start at West Brom on Sunday. With a side shorn of mainstays Jordan Henderson, Adam Lallana and Sadio Mane, the boys from Brazil offer a much-needed injection of quality, as their appearance for the second half at the bet365 Stadium showed. However, Klopp insists the pair cannot be expected to produce heroics on their own to single-handedly secure Champions League qualification. "It's very important that players can play together, but if they are only two then it's pretty difficult still," he said. "Gini Wijnaldum said it after the game, I think - yes, they had a big impact on the game, that's 100 per cent true, but the whole team played better in the second half. "If we would have played like that in the first half and Roberto and Phil would have been on the pitch, I can only imagine if the difference would still have been that big."